What’s flamenco you say? Flamenco is a pulse, it’s energy, beauty and non-beauty, unexpected sparks of emotion, spontaneity, humorous moments and poignant ones, and you can’t always be sure which is floating to the surface at any given moment. Cañeta is all of that. March is just around the corner, “women’s month” they tell me. Last week’s article was about the great veteran singer María Vargas, and here we go with another formidable lady: María Teresa Sánchez Campos, “La Cañeta de Málaga”. By now you all know I take a dim view of feminism, so in actual fact, I’m going to talk about Cañeta, not because she’s a woman, but because she is a great flamenco artist whom I’ve admired since the 1960s, because on February 8th a street in Marbella received her name and because she is still active and dynamic in her eighth decade – and the word “active” is to be taken literally. What’s flamenco you say? Flamenco is a pulse, it’s energy, beauty and non-beauty, unexpected sparks of emotion, spontaneity, humorous moments and poignant ones, and you can’t always be sure which is floating to the surface at any given moment. Cañeta is all of that. She has the knack of coloring everything flamenco. A specific kind of temperament tinged with home-spun authenticity and artistic innocence from a position of instinctive good taste cultivated over a lifetime. Nothing frivolous here, this is no cute little old lady in polkadots, despite the predominantly festive nature of much of Cañeta’s repertoire. Her occasionally humorous bulerías or tangos are, in essence, searing and plaintive if you scratch the surface just a bit. Isn’t that how flamenco goes after all? A street in Marbella’s neighborhood Divina Pastora, despite her coming of age in Málaga’s historic flamenco neighborhood El Perchel, seems way too little when you consider some flamenco interpreters in other towns who have been worthy of life-sized monuments. But let’s be gracious and celebrate the happy occasion; anything that’s good for flamenco and its interpreters enhances the genre as a whole, and is cause for celebration by followers of the art. 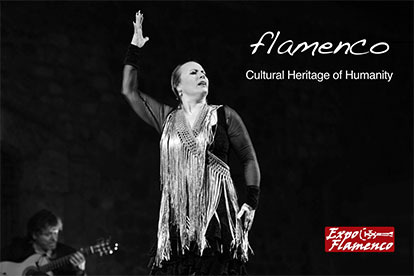 It would be impossible to name all the major flamenco stars Cañeta has performed with. A condensed summary of her biography would have to begin with her mother La Pirula whose house was a sort of point of encounter for the flamenco community of the era according to elder Málaga artists. 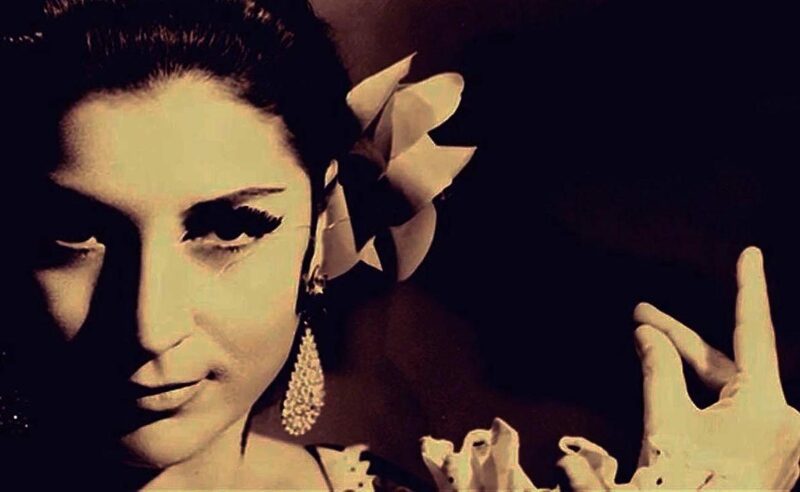 La Pirula died when Cañeta was a young girl who then continued her basic orientation in the down-trodden but preeminently flamenco neighborhood of El Perchel, performing with la Repompa and other youngsters. 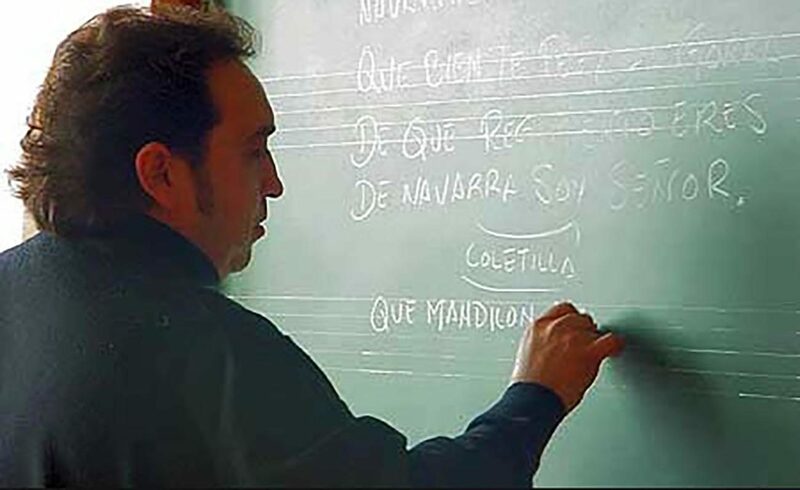 After those hard-scrabble beginnings in the post-civil war years, Cañeta went to Madrid early on, and was one of the first artists to perform at the legendary Corral de la Morería in the nineteen-fifties, eventually making the rounds of the tablaos. 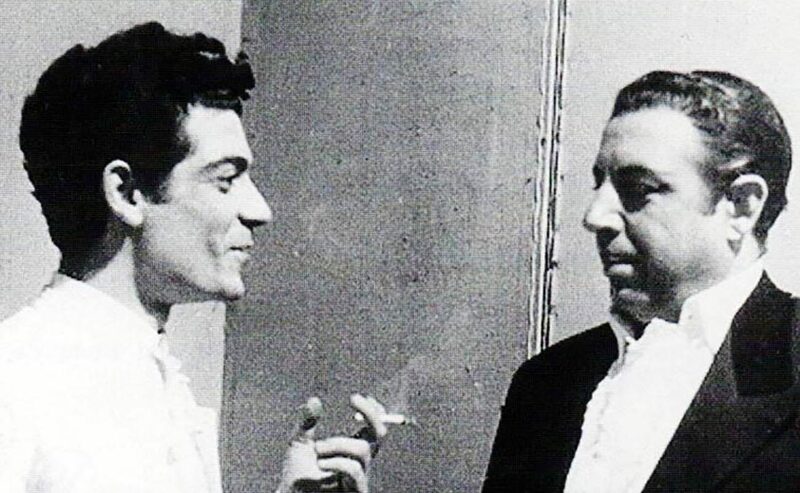 Then came her decades-long marriage to flamenco singer José Salazar (Premio de Córdoba 1956), the man behind the woman for so many years, who encouraged her to sing when she had primarily been a dancer. Cañeta and José recorded together, toured the world including a long contract in Japan before it was common for flamenco artists to go to that country, they have been featured at nearly every major festival, traveled with the company of Antonio Gades, opened two tablaos of their own in Puerto Banus, Marbella, and have quietly but steadily spent a lifetime contributing their great knowledge and experience to expressing a dimension of flamenco that at times seems to be slipping away. 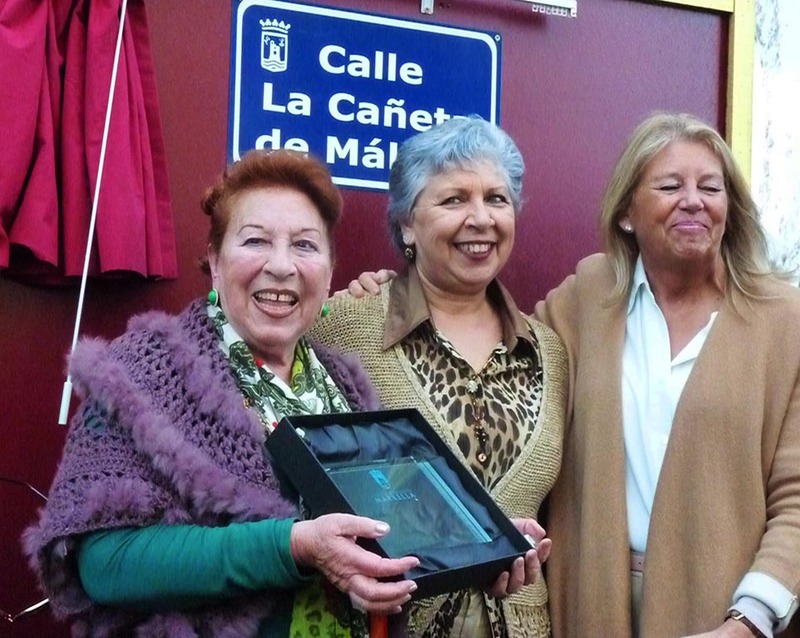 After the unveiling of the street sign that bears her name, and after much protocol and official photos with the mayor of Marbella, we made our way to the Sierra Blanca flamenco peña where guitarists Antonio Soto and Chaparro de Málaga accompanied a spirited fiesta por bulería, including Cañeta’s participation. 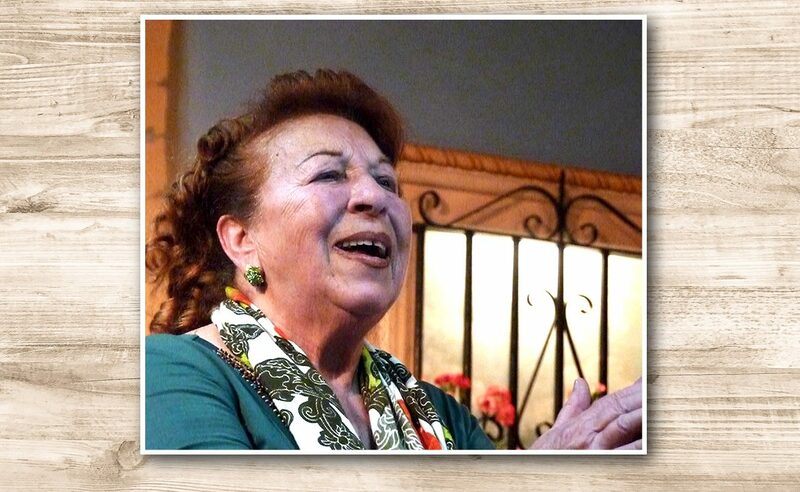 Despite her having announced on several occasions plans to retire, we will be able to enjoy the art of Cañeta de Málaga this coming August when she is set to perform at the 52nd edition of the Fiesta de la Bulería in Jerez.